The Rolex Day-Date Released in 1956 and lasting just over a year, the Rolex 6511 model, first known as the "Rolex Day Date", had a day window showing at twelve o’clock as well as the date shown at three o’clock. Due to the complexity of the watch and its automatic movement, additional discs and a screw down back was added. Although the early Day Date was waterproof up to 165 feet, this resulted in a rather bulk appearance but in Rolex’s never ending strive for perfection and modernization, designers later changed the look to a much slender shape enjoyed today. The Day Date was available in white gold, yellow gold, rose gold and platinum. Rolex’s 6611 models that were waterproof up to 100 feet soon replaced the Day Date but it was still externally identical to the 6611. The 6611 featured the new caliber 1055 movement with its free sprung Micro-Stella balance, the first to be labeled "Superlative Chronometer Officially Certified" on the dial, and had a new accuracy standard guaranteed. The Day Date earned the nickname the "President" when Rolex apparently gave one to then President of the United States Dwight Eisenhower. With only a few minimal changes in the case design over the years, the first large modification to the Day Date was the addition of the hack feature in 1972. This allowed the second hand to be stopped if you wanted to set the time to match an accurate source. At this time, the shape of the head was essentially the same as it is today. The "quick-set" feature solved one of the watches’ biggest problems. 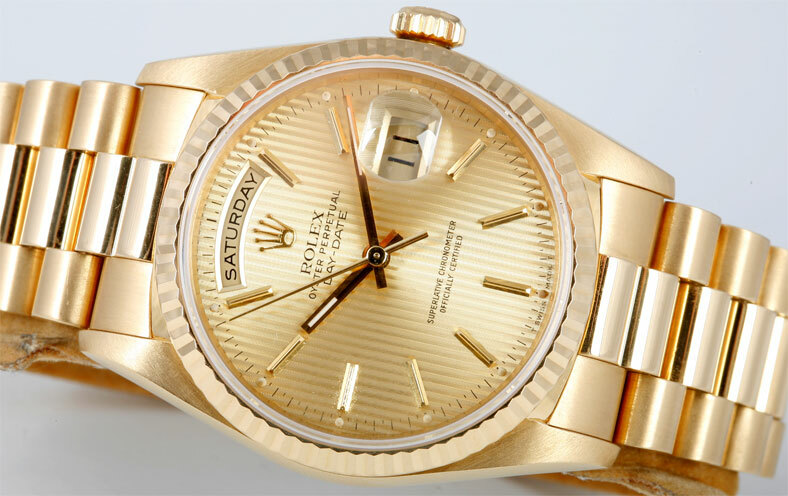 Introduced in the late 1970s, the quick-set was added to all Rolex models by 1983. Instead of turning the crown to speed time to change the date to the correct day, the wearer could now pull the button out half way and in an exclusive function, change the date until the correct date was displayed. The introduction of the quick-set feature also coincided with other progress for the Day Date. The inclusion of the sapphire crystal not only gave the watch a more attractive appearance but it also added to the durability of the watch. The sapphire crystal fitted tighter than the plastic glass used before and rendered the watch glass nearly scratch proof. Also in addition to the advancements structurally and internally, Rolex introduced a new number system that, for some models, is still in use for today. An extra digit was added to the model number. 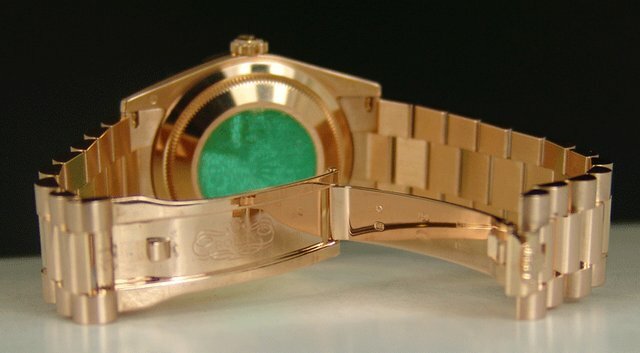 Introduced towards the end of 1990 was the "Double Quick-Set" watch, Rolex model number 18238. This model made the setting of the Day and Date even easier as they could both be set independently from each other and the time. Rolex also expanded their Crown Collection to include all types of precious stones, although they were available with diamonds on the bezel at their debut. 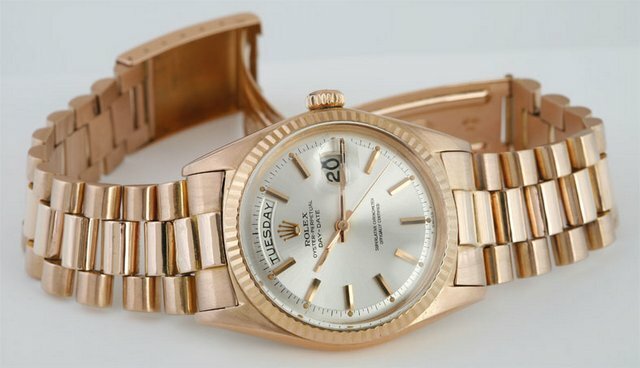 At the end of 2000, Rolex reintroduced the Day Date in rose gold and also with a domed sapphire mineral glass. The "day wheel" on the Day-Date President is available in the following 26 languages: English, Spanish, Arabic, German, Chinese, Danish, Basque, Catalan, Ethiopian, Finnish, French, Greek, Hebrew, Dutch, Indonesian, Italian, Japanese, Latin, Moroccan, Norwegian, Farsi, Polish, Portuguese, Russian, Swedish and Turkish. The Rolex Day Date, famously known at the Rolex President, has become an icon for class, style, and success. 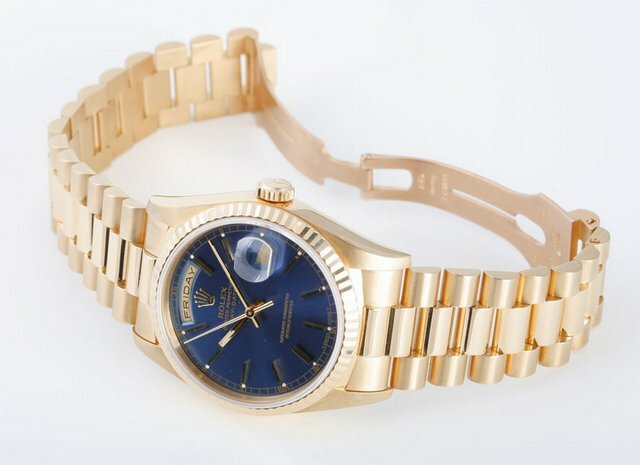 It is no doubt one of the most prestigious Rolex watches available today. To view the selection Watch Chest has to offer, click HERE.